SureLAN™ MegaLine® Category 8 SU/FTP | Belcom Cables Ltd. 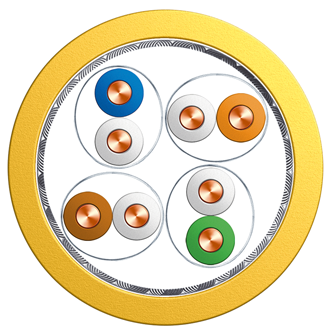 Installation cable for use in structured cabling systems acc. to ISO/IEC 11801 and EN 50173 (2nd edition) and for home cabling systems acc. to ISO/IEC 15018 and EN 50172-4. Ideal for all applications from Classes D to FA Multimedia (TV, video, data, voice) > 10 GbE acc. to IEEE 802.3 an, cable sharing, VoIP, PoE.